Richard Carey Wolfe was born on October 12, 1848, at or near Chicago, in Cook County, Illinois. His parents were Maurice Wolfe, an Irish Catholic farmer, and Ellen Catherine Carey. Wolfe's siblings included James Carey (b. 1831), Ellen (b. 1833), Maurice Carey (b. ca. 1835), Mary (b. 1838), John Carey (b. ca. 1840), Thomas Carey (b. 1843), Margaret (b. ca. 1845), Johanna (b. 1847), Catherine “Kate” (b. 1851), and Bridget Veronica (b. 1854). The year before Wolfe was born, his parents and several siblings emigrated to the United States from County Kerry, Ireland, along with Maurice Wolfe’s first cousin John Richard Wolfe and his family. (Maurice Wolfe and John R. Wolfe shared a grandfather, James M. “The Barrister” Wolfe.) The families arrived in New York on August 23, 1847, and from there made their way to Chicago, where Richard Wolfe was born. The Wolfes then traveled to LaSalle County, Illinois. John R. Wolfe and his family moved to Clinton County, Iowa, around 1855. His brothers Maurice Richard and Richard, who came separately from Ireland in 1849, stayed in Illinois, as did another brother, Thomas Richard, who came in 1848. Maurice Wolfe’s own brother, Richard, came from Ireland in 1848. Maurice Wolfe and his family, including Richard Wolfe, moved to Clinton County in the spring of 1859. Richard Wolfe married Margaret McGonnegle, of Jefferson County, Indiana, on April 16, 1877, in Clinton County. The couple had seven children: James (b. 1878), Ellen Calista “Nell” (b. 1880), Maurice Vincent (b. 1882), Edward Anthony (b. 1884), John Gregory (b. 1886), Catherine W. (b. 1889), and Joseph (b. 1892). Margaret Wolfe died on June 8, 1894, in DeWitt, in Clinton County. Richard Wolfe married Ellen “Nellie” Murphy, of Delaware, in 1900. The couple had five children: twins Richard Joseph and Leo (b. 1903), Raymond F. (b. 1905), Mary (b. 1907), and Robert (b. 1910). Richard Wolfe farmed in Liberty Township, Clinton County, and served as constable before, in the autumn of 1884, being elected justice of the peace. He remained in the position until his death. In 1895, he retired from farming, renting out his land and moving to DeWitt, in Clinton County. There, the census of 1910 indicates that his brother Maurice lived with him. 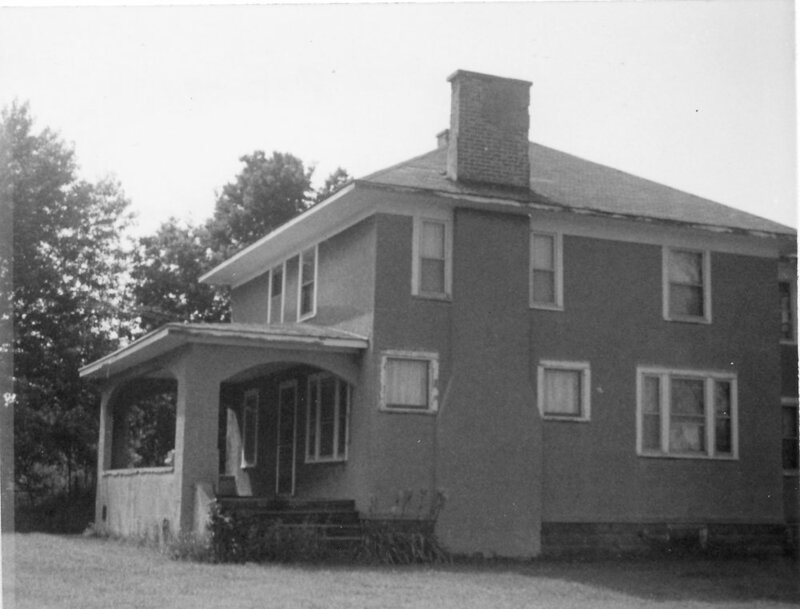 In 1916, Wolfe returned to his farm, then presumably run by his children. Nellie Wolfe died sometime between 1910 and 1919. 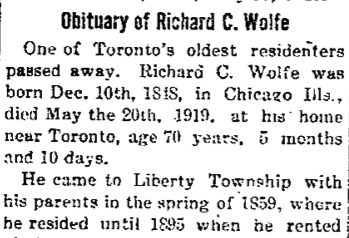 Richard Wolfe died on May 20, 1919, after a short illness. At the time of his death, he owned 437 acres, between 50 and 60 head of cattle, 9 horses, and 70 hogs. He is buried at Saint James Cemetery in Toronto, Iowa.